For some reason I can't get the Random Number Generator to show up in Blogger, so you'll just have to trust me. Congratulations! Please send me your mailing info (DianeCademartori at gmail dot com), and I'll get your shuttle off to you as soon as possible. Thanks for joining in the fun, everyone! Happy Halloween! I haven't decided which shuttle I can part with, but one of these spooky little cuties will go to a lucky commenter. The drawing will be on Halloween. Leave your comment on this post for a chance to win! I won a drawing on Jon's blog, and my prize arrived today! Isn't that a lovely shade of green? I'm really looking forward to getting started with all these wonderful goodies. Thank you, Jon! I haven't had much time for blogging or tatting for the past week. My youngest daughter's father-in-law is visiting from Slovakia, and Joanne and Jan are driving down from Minnesota with Jan Sr. for a visit this Thursday. Dave and I have been busy getting the house in order. That has involved finishing window frames in the bedrooms upstairs, cleaning up the mess, and getting the rest of the house clean. Believe it or not, I even worked on my sewing room! I still have quite a way to go, but at least I can move around and work in there. Congratulations, Marilee! 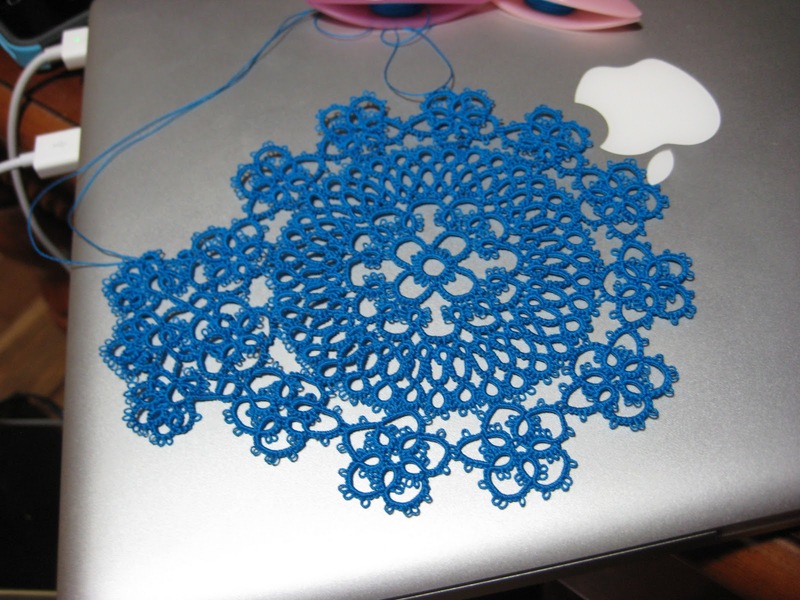 My next big thrill will be when they stop listing tatting under "Technique: Crochet." This weekend was the first weekend of the Jaycee's Haunted Trail, and I was drafted as a volunteer. It was lots of fun, but I have no energy left! I never, ever stay up until 11, and that's when the trail ended! Friday night was chilly and windy. I stood outside, braving the elements (luckily I had dressed in layers), taking tickets from 5:30 - 10:45. I talked with lots of people, and even told a ghost story to two little boys! I don't know if it was adrenaline, chill, or being over-tired, but the last time I looked at the clock, it was 1:45! Did I sleep in? Yup... I didn't get up until 6 a.m.! Dave and I had lots of errands to run Saturday morning, and I decided to take a nap so that I could help again Saturday night. I slept from noon to 3:30... longest nap I've ever taken when I wasn't sick! We were home by 11:30, and I did manage to sleep in until 6:45. I've been playing catch-up this morning... laundry, mail, housework... doesn't look like there'll be much chance for tatting today! I only managed two more pattern repeats. I think I must be part bear, because I feel like I'm going into hibernation mode... always hungry, always sleepy! After experimenting with different stitch counts, I think I like the instructions I have written. If you try my version, please let me know what changes you'd make. My version of the pattern can be found at the top of this page. This challenge has been a lot of fun! I haven't made much progress, only two pattern repeats. I've been so sleepy this week that I find it difficult to keep my eyes open once I sit down in my chair! but I did finish cutting squares for a new quilt! Some of you have asked for my directions for the Yes-U-Can Doily. If you follow the link at the top of the page, you'll find my interpretation of the doily. I'm not a designer, and my pattern writing skills leave a lot to be desired, so please be patient! If you do find any glaring mistakes, please let me know so that I can correct my copy of the pattern. I think I have the final round figured out! It took me three tries, and I may find that my stitch counts don't work, but it looks pretty good right now! Yes, I have been writing down the pattern as I go. I don't know how to save it as a PDF. If you're interested, send me an email, and I'll be happy to share what I have written down. Please keep in mind that while I read patterns regularly, I've found that writing patterns is a royal pain in the neck! I make no guarantees that you'll be able to follow my notes! The floral motif round is completed! Now for the real challenge... the final round! I can't believe I only have three motifs to go before the final round! With any luck, I'll get them finished tonight. Then I'll really have to put my thinking cap on! Martha's new book arrived in the mail yesterday. There are some glorious designs and tons of new techniques for me to learn. I'm thinking of digging into my hand-dyed thread stash for these beautiful designs! Three more flower motifs completed! The more I work on this doily, the more I love it! Two more flower motifs! That means this round is 1/4 finished! Slowly, slowly, slowly... it's coming together! I finished the second round a few minutes ago! It's been a busy day... starting with a 5K walk, part of our town's Oktoberfest. I met my goal... finished in less than an hour this year. Now I'm pooped, so I think I'll head off to bed early. I'm sure I'll be tatting some more tomorrow! Note: Thank you to Jeff, who let me know that the original source for this pattern is the wonderfully talented Nancy Tracy! I managed to get the chains I wanted, but the result was a rather ripply piece! I pinned and steamed, but there's still a little bit of ripple. The good news is, I have the correct number of rings!